Born in Munich, Germany, Katharina studied modern oboe in the Conservartories of Hannover with Klaus Becker, Hamburg with Rainer Herweg and Mannheim with Winfried Liebermann graduating with 1st Class Honours. She has performed as oboe soloist in the “Gustav Mahler Orchestra” and has tought oboe at the School of Music of Hamburg. In Hamburg she also elaborated her musical skills by studying historical woodwind instruments with Renate Hildebrand at the Hamburg Conservatory, finished her studies with the Diploma with 1st Class Honours. For further widening her expertise of historical oboes and shawms she then studied with Katharina Arfken at the “Schola Cantorum”, Basel and has participated in master classes with Ku Ebbinge, Alfredo Bernardini, Paul Dombrecht and Bruce Haynes. Katharina has worked with Claudio Abbado, Pierre Boulez, Gottfried von der Goltz, Andrea Marcon, Carles Magraner, Marc Minkowski, Michael Schoenheit y Ludger Remy and has performed with Akademie für Alte Musik Berlin, Les Musiciens du Louvre, Barockorchester L´Arco, L´Arpa Festante, Musica Fiata, Dresdner Instrumentalconcert, Capella de Ministrers, Orquesta Barroca de Sevilla and Ministriles de Marsias. With Capella de la Torre, Duo mixtura (contemporary music for shawm and accordion) and others Katharina has appeared on more then 30 various recordings of CDs. She also forms part of many radio broadcastings, e.g. for Radio France, Suisse Radio, Radio Canada, MDR, NDR, DLF, DLR and WDR. 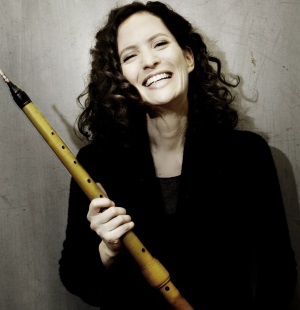 She has given master classes of medieval and renaissance music at the Conservatory of Amsterdam and is currently living in Berlin, where she also teaches oboe and shawm.